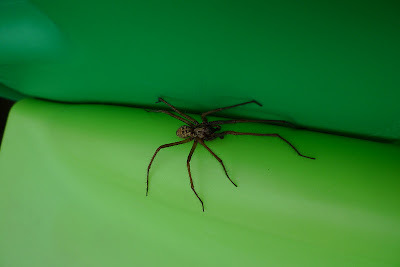 We have had a few visitors of the arachnid variety recently! I always forget just how big these guys seem when they're scurrying across your living room floor. But, as we tell Maisie, they are nice guys, just looking to get in from the cold for a while... This photo was taken a while back, we seemed to have had at least one a day in the house for a while but as Tegenaria domestica are widespread and common it's no surprise to see them often. We get something similar to that in Wyoming. My husband catches them and then uses the internet to make sure they aren't deadly before releasing them outside....they are always the same kind of spider. There is some sort of elegence in the way they look, huh? That is an excellent photograph.